Dogs that do a lot of attention seeking or demand barking are hoping to get what they want. This is great when it comes to your dog wanting to go outside for potty breaks. But not so great when it comes to your dog demanding other things, especially when you’re busy. Our dogs used to do this constantly whenever someone was on the phone, and because it was easier to just give in and rub them while we talked, it took a while to break them of the habit. 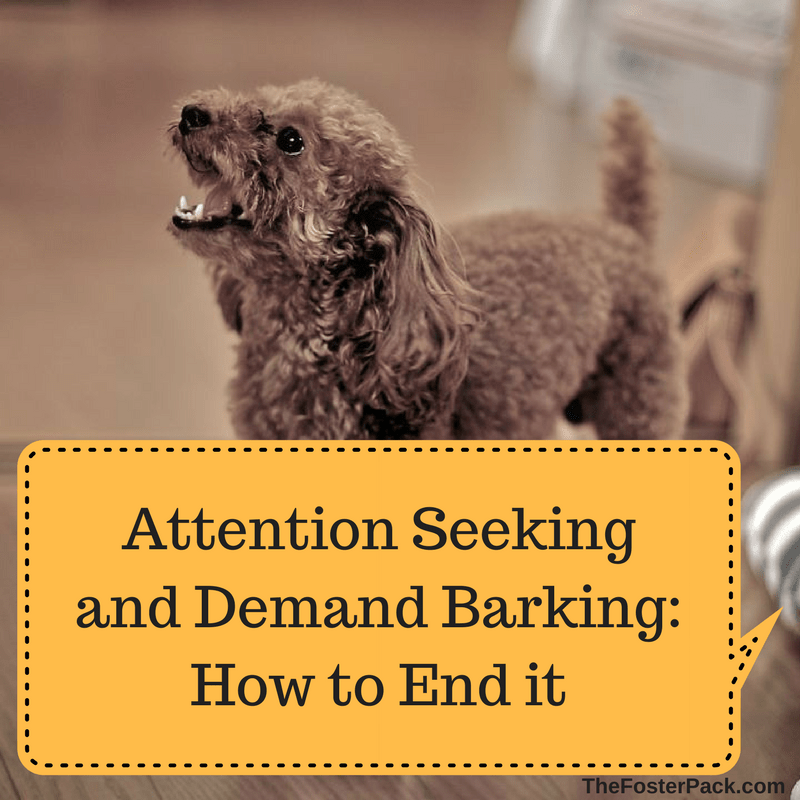 So how do you stop your dog’s attention seeking or demand barking? There are a few different tactics that you can try. The first thing that you need to remember is not to give into the dog’s demands. As soon as his demand barking gets him what he wants, he’s going to continue to bark whenever he wants anything. Ignore his barking. It may drive you crazy, but learn to tune it out for a while. By ignoring your dog’s demand barking, he’s not getting any reward for his effort. Walk away, go in another room. But don’t look at your barking dog, don’t speak to him. Ignoring him take the power out of his bark. If you give into his demands, you’ll soon be a slave to them. Distraction is a good way to stop attention seeking and/or demand barking. Such as in the case above, where the dog barks when you get on the phone. Keep special toys handy, such as previously stuffed Kong toys in the freezer, or treat dispensing toys kept just out of sight. These types of dog toys are great for distraction toys when you need a few minutes of silent busy dogs. Hopefully, your dog already knows the basic dog commands, and now it’s time to add Quiet to his dossier. Teaching your dog the Quiet command will help stop most types of barking, not just attention seeking barking. Marking behavior is a simple way of training your dog to do the things that please you, without actually training him. Carry high value treats with you, preferably in a “smell proof” bag, and when your dog is being quiet, give him the command and a treat. Marking the quiet behavior is great for stopping not just attention seeking and demand barking, but for all the most common types of barking.